The post Bitcoin Price Getting Ready To Move appeared first on CCN: Financial Bitcoin & Cryptocurrency News. While Danish crypto currency exchange CCEDK has signalled that it is to become a hub for a series of “diverse projects” and services, with the current trading engine ceasing for good this May, investors should not panic as the shutdown will allow the exchange to initiate a major upgrade. Once revamped it relaunches as a Decentralized Conglomerate on 1 July - aka an enterprise ecosystem engine. The post Bitcoin Core Threatens a Hard Fork over Asicboost Mining Optimization appeared first on CCN: Financial Bitcoin & Cryptocurrency News. The post Coinbase Co-Founder Ehrsam: Bitcoin’s Open Network Beats Private Blockchains appeared first on CCN: Financial Bitcoin & Cryptocurrency News. Missed bitcoin's big scaling debate? In this opinion piece, University College Dublin's Dr Paul Ennis breaks down the various stages. In 2011, Thailand was the world's largest exporter of rice, accounting for about 30% of the global market. But then prime minister Yingluck Shinawatra introduced a controversial rice scheme where the government would pay farmers almost 50% more than market prices. The idea was that since almost 40% of Thailand's labor force worked in agriculture, then it would make the average Thai wealthier while also creating a rice shortage by taking supply off of the market. In theory, the government would then be able to sell the rice at an even higher price. But prices didn't rise as much as the Thai government was anticipating, and then competitors — India and Vietnam — began to flood the market and lower their prices. That left Thailand with a ballooning inventory of rice and warehouses filled to the brim. Fast forward to 2016, and Shinawatra has been out of office for two years after being removed by a military coup. Thailand is now the No. 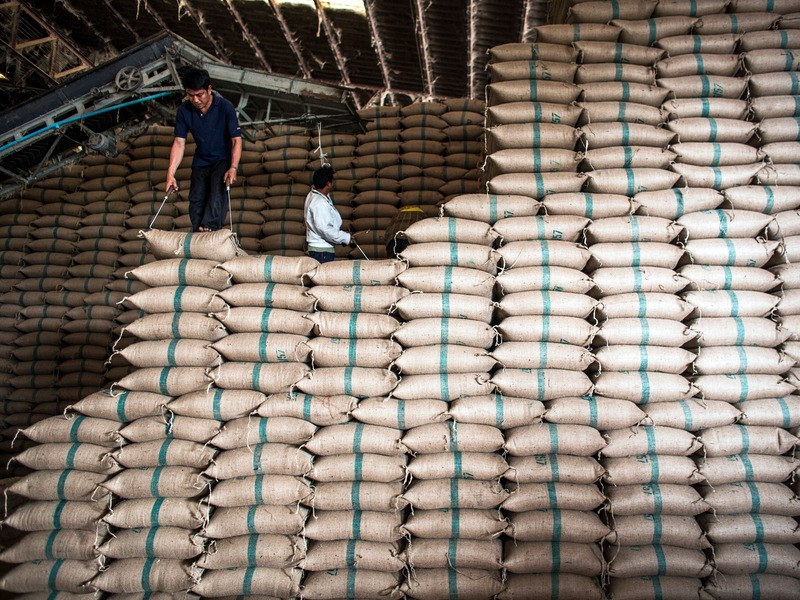 2 rice exporter in the world, trailing rival India, and its rice stockpile is still enormous. But there might finally be some relief in sight. The El Niño of 2015-16 has caused drought conditions across much of China, India, and Southeast Asia. And while farmers in Thailand and elsewhere in the region are being devastated by the weather, the Thai government has an opportunity to unload a good portion of its stockpile. 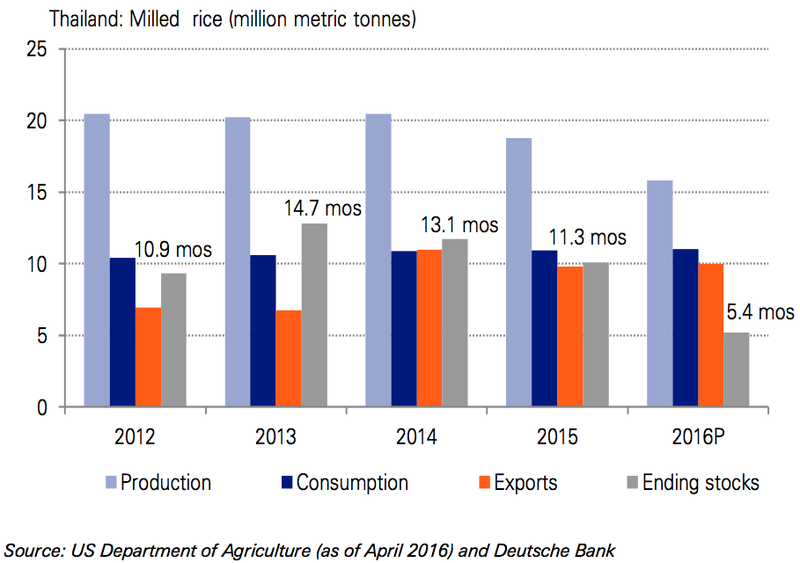 According to the US Department of Agriculture (USDA), Thailand's rice inventory is set to drop by almost 50% to 5.2mn MT in 2016 on the back of a projected decline in domestic output to a five-year low of 15.8mn MT. And the good news doesn't stop there. It is highly plausible, in our view, that Thailand would take this El Niño episode as an opportunity to clear its huge stockpile and regain market share as shipments of rival exporters will likely be curbed by reduced domestic output.